The True Story of Lee Israel and the Literary Forgeries in Can You Ever Forgive Me? All the time Sebastian was surrounded by his fans when he was on his way from the Red Bull hospitality to the pit lane. He tried to write many autographs, but it was very difficult because of the hectic around and because of the bodyguards. When he was able to sign his signature was ugly. 1-2 times per day Jenson and Lewis went to t he fence which sourrounds the paddock to write autographs. If you were lucky enough you had the chance to get 2-3 autographs. Beside this opportunity there was nearly no chance to meet them. Fernando joined the fans at the fence several times. Each time he left the paddock it was possible to collect him on this way the Ferrari Boat in the harbor. But without luck you got nothing. Sometimes he wrote nicely, sometimes ugly. Felipe was good to collect in the infield of the charity soccer match. The other days he was not seen very often. When he wrote at the fence his signature was not nice. During the charity soccer match he wrote some autographs. But the following days he nearly stopped signing and was not seen very often. Nico has become a tough signer. His signature is ugly, he is always in a hurry. It was impossible to get more than 1 autograph per day. As in the past Kimi was one of the toughest singer at Monaco. He was line Nico, always escaping and writing nearly nothing. Romain started beeing strange. He didn’t sign more than 3 photographs per meeting. After doing that he quitted signing without saying anything. Every time we met him he signed. But his new signature of 2012 becomes more and more short. But Paul was OK.
Nico was always kind and writing a lot. His signature is still nicer than in 2010. Kamui has also become one of the toughest signer. He writes rarely and fast. Nice autographs of him are getting scarce. Sergio was always in a good mood and he wrote OK. But he is always signing across the image and car. His sign is getting bigger and bigger. He was always friendly and he fulfilled nearly every autograph wish. But after some time he tried to pass the fans without signing. At the beginning of the Monaco days he was kind and he was writing much. But similar to Daniel he began to run after some time. His signature consists of some strokes. Ful l signs are getting rare. Pastor has shortend is signature. It is now just a “PM”. He tried to write at any time, but he was in the focus of all collectors and fans because of his win at Barcelona. When we met him he signed OK. But he stopped signing after a few photographs. He was also focused by the crowd and sometimes he wrote ugly. Vitaly was signing very nice, nearly every time he signed nearly a full version of his signature. Kind as always. Wrote well. Suberb! Like Pedro he was very friendly. But if was difficult to meet him. He signed very nice. We were lucky to get him during the soccer match. Near the paddock he was difficult to obtain. He was the most friendly driver at Monaco and signed every photograph. But how long will he behave like this? To meet Damon was one of the highlights. He signed nicely and much. Great, because this is a rare behavior of him. He had a fracture of the clavicula. So it was impossible to collect him. We asked him one time and he was nearly unable to write. In contrast to his normal behaviour he signed not much and was a kind of stressed. Only one autograph per meeting. 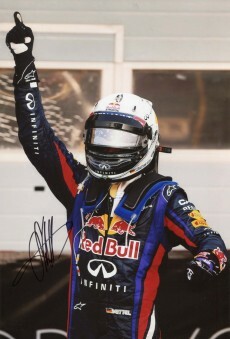 Sebastian Vettel was the nicest driver at the Nürburgring F1 Grand Prix. He signed a lot and in contrast to the past races very nice. When I have heard that Steven Spielberg comes to my city I was deeply excited. I thought about a chance to get one of the best autograph in my collection. Spielberg has shoot scenes here in Wroclaw to his new movie called 'St. James Place'. Basically, sets were located in Berlin and Potsdam, but a crew planned to visiting Poland for a few days. Additionally, local media spread rumors about Tom Hanks, Janusz Kaminski or Sebastian Koch are coming as well. Finally, in the middle of November, here they come. If you like to share knowledge, collectibles of your collection or autograph related articles we would be glad to hear from you.